Still, this beautiful wrapper isn't enough to cover up Poncho's fundamental flaws. It's a lovely experiment and although it works well in some parts, an overall sense of cohesion is missing. Being able to move along the z-axis is a clever feature yet Poncho uses this as a crutch, failing to flesh out other essential areas of the game. In short, there's certainly something special here yet, sadly, only a minority will succeed in finding it. Poncho is memorable with its lush pixel art and catchy music but also for its frustrating level design relying on a single infuriating mechanic. Poncho is a fun but sometimes ponderous platform puzzler, with an impressive core mechanic and fun visuals that are slightly let down by moments of frustrating gameplay. As fun as often as it is frustrating, Poncho is a hard game to recommend, even to 16-bit platformer super fans. You may be able to get some enjoyment out of it, and it certainly has an oddball charm, but ultimately, it fails to impress where it counts. The parallax layer hopping is neat and at times can be fun. Unfortunately, the game falters too often and descends into maddening tedium. 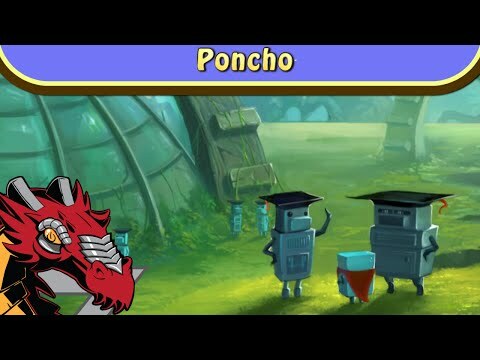 Retro platformers may be stylish these days, but sadly, Poncho hasn't quite pulled it off. A wonderfully fresh take on the apocalypse with some stunning pixel-art visuals and pixel-perfect platforming, a handful of bugs and glitches occasionally infuriate but aren't enough to significantly compromise what is an otherwise tremendously enjoyable experience. Poncho lives much more off its puzzles and mental reasoning demands than of platforming action - not to mention it features unlimited lives - and any potential for a fluid action game is lost in this. Credit must be given to Delve Interactive for encouraging exploration in a genre that is regularly perceived as one of the most linear gaming experiences on offer. The complication of this depth is the fact the platforming and puzzle elements of Poncho become quite a test over time, and often require an excessive amount of trial and error. This title is not for faint-hearted players as a result; each puzzle and platform element can be cruel despite the infinite retry feature. There is no hand holding and there is no instantaneous sense of accomplishment or joy as you would receive from a more traditional platformer. Check out Poncho if you enjoy puzzle problem solving within a slower-paced platforming game environment, otherwise think carefully before trying it out. There are times in which Poncho could've used some smoothing over, like with glitches or painfully missed jumps. That said, it's still an entertaining little treat for the retro crowd, especially those seeking something different from the usual platformer. Though shallow in its execution, the plane-switching mechanics of Poncho contain enough cleverness to prove intriguing. With a pleasingly melancholy atmosphere and beautiful pixellated visuals, the titular robot seems destined for a truly memorable side-scrolling puzzle platformer. Unfortunately, this is not it. Reality itself may be a lot less pixellated here, but Poncho's well-planned orchestration of sound, aesthetic and more importantly art direction resonate remarkably well. For a game so mechanically simple, it's one of the better experiences out there — four-letter swear words and all. Poncho is a short adventure with excellent storytelling and amusing aspects, but far from being a flawless game, because of its technical issues, lack of challenge and altogether limited gameplay potential. An unexceptional game, but with enough personality and redeeming features that prevent it from being immediately forgotten. Poncho needs work before anybody should consider purchasing it. There is a strong attempt with this title, since the designers do not arbitrarily drag the user by the nose and let them freely explore the world. The whole game is just completely undermined by the bugs, which can be fixed. Gamers who are curious about Poncho should approach with caution and be ready to restart their sessions frequently. When it works, it's a solid game; it is just a question of if it will work or not. PONCHO is a 2D side scrolling puzzle platform game by Delve Interactive, which combines a clever gameplay mechanic with detailed and beautifully rendered pixel art. The game uses both back and foreground layers to create complex puzzling challenges and platforming. The results on the whole are mixed, but once the player adjusts to timing the command to zap between layers whilst jumping, there are some moments of entertaining gameplay. For everything that Poncho is, it still remains stagnant. The interesting idea of an apocalyptic scenario not filled with zombies is met with great artwork. However, it soon gets humbled, and the gameplay that follows is somewhat painful to play. Understanding the mechanic of swapping between layers is simple enough, but understanding how the world works around it is arduous, and at the end of it all, leaves a bad taste in the gamer's mouth. Poncho is that kind of indie game you have saved as an .exe file somewhere in the depths of your computer. It's something you stumble upon and unravel at your leisure, but you keep finding out that it gets deeper as you go. It manages to be a puzzle platformer which transcends figuring out patterns and jumping on things, and while the basics need polish it's definitely a title which deserves your attention. Poncho, a game that a week ago, honestly I knew nothing about. It however was highlighted on Nintendo’s eshop update this week along with a trailer and it instantly hooked me. We at PSVG reached out the to the development team and they were gracious enough to supply us with a review copy of the game. I played the game on the Wii U entirely on the gamepad (just felt right) but it is also available on PS4, Vita, PC and Mac. There are inspired moments throughout, and the pixel art is of an incredibly high quality, but Poncho often fails to capitalise on the great ideas that are briefly teased.